For any PC case modding enthusiast, finding computer peripherals to match a build is always a struggle. Most manufacturers aren’t going to have the right mouse to match a specific build’s look and feel off the shelf, which results in having to mod the peripherals too. Fortunately, modders who build retro systems might be in luck with Azio Retro Classic Mechanical Keyboards. They have just the right balance of retro style and modern function to complement most steampunk case mods. You can pick from a variety of Azio Retro Classic mechanical keyboards on Newegg. 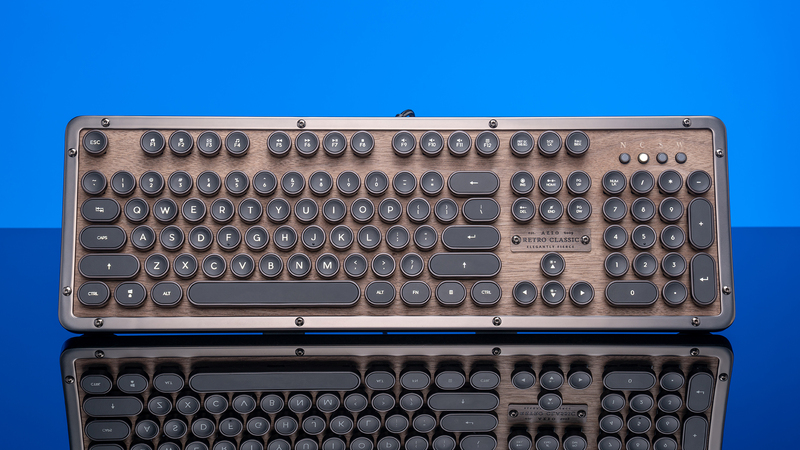 As the product name implies, the Retro Classic line of Azio mechanical keyboards is styled to remind of Remington typewriters with iconic round keycaps. 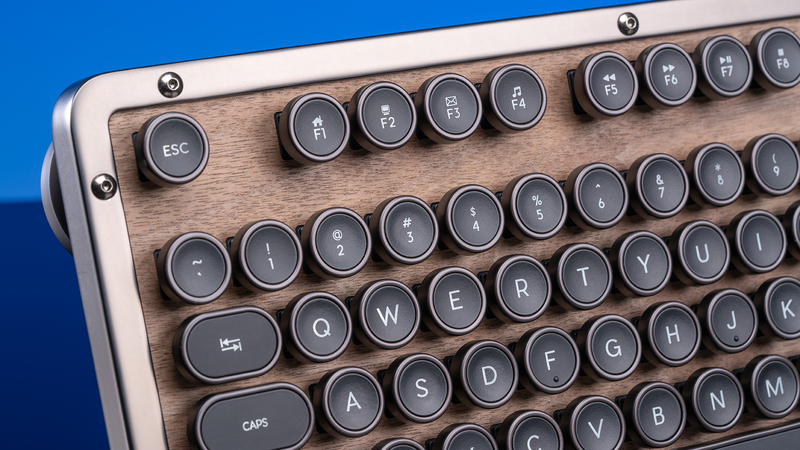 To augment the typewriter feel, the Retro Classics use Kailh mechanical switches that offer tactile and aural feedback in the form of a small bump when pressing keys, and a satisfying click with each stroke. Azio doesn’t specifically identify which Kailh switch they use in the Retro Classics, but it’s a safe bet that the switches are Blue considering the performance and that Azio uses Kailh Blue switches in their similarly styled Armato Classic Edition. 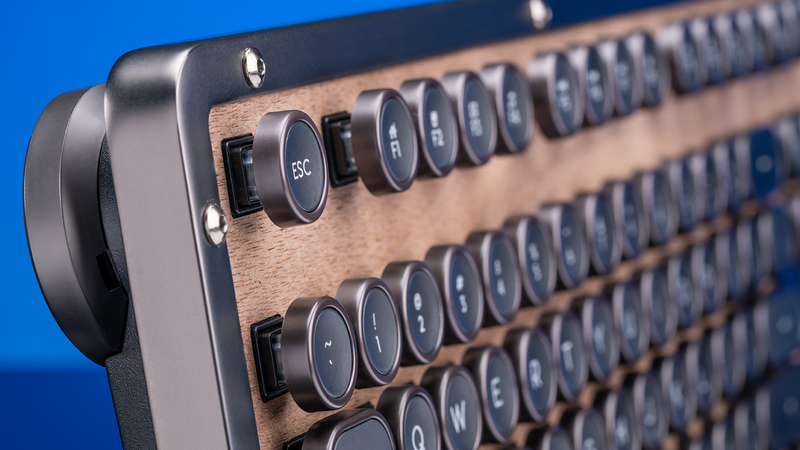 Blending into the nostalgic design language are industrial touches, like the aluminum frame that surrounds the keyboard and is fixed in place by several exposed and raised Allen wrench screws. Two of those screws hold a small plaque in place on the top panel. The top panel is available in wood or three colors of genuine leather. The bottom of the keyboard is constructed from hard plastic, and features four round metal feet that have rubber pads underneath them. They do a good job of keeping the keyboard from sliding around. The back feet can be raised or lowered by rotating them. Finally, the Retro Classics feature a braided keyboard cable. The Retro Classic keyboards are backlit with white LEDs and offer a couple of lighting options beyond on/off and brightness. Using the FN key in conjunction with other specific keys, users can switch the lighting profile to either Breathing or Reactive patterns. Breathing makes the keys brighten and darken on a consistent cycle. Reactive only backlights a key when it is pressed and will darken again after a second. This creates a trailing pattern that follows the user’s keystrokes. Additionally, each function key has an alternate function that controls media or specific applications. F1 through F4 open the browser, file explorer, email application, and media player respectively. F5 through F11 are media player controls. And F12 opens the calculator. Altogether, it’s nice to have the extra functions without having extra dedicated keys that might spoil the design aesthetic. Typing felt better than expected. 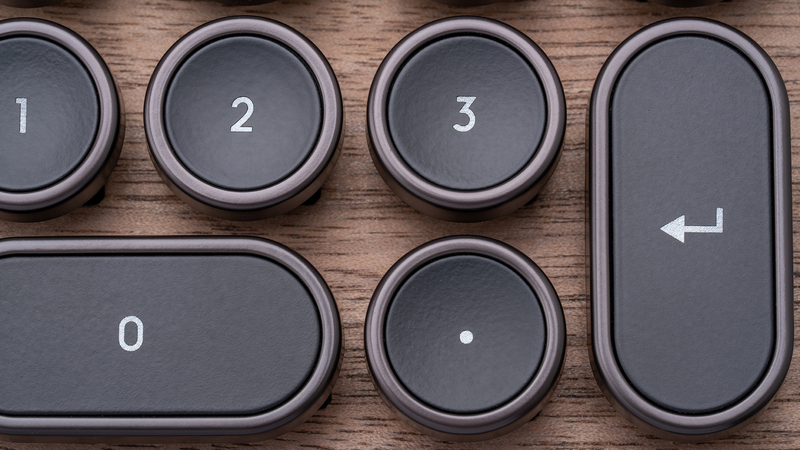 All of the circular keys, like the letters and numbers, feature concave curves to their keycaps which cradle fingertips nicely. However, while typing felt better, my accuracy decreased, which I attribute to the circular shape of the keycaps. All of these years of typing on square-ish keycaps has probably conditioned my muscle memory to feel confident in tapping keys in their corners. As such, while using the Retro Classic, I found my fingers awkwardly landing in the spaces between keycaps. I lost about 10 words per minute during typing tests because I kept going back to correct mistypes. I’m sure that I’d be back to average speed with enough time using this keyboard, but there is a learning curve. Surprisingly, I didn’t notice any degrade in performance while gaming. I put the Retro Classic through a couple of matches in StarCraft 2 and my APM was about average. On the other hand, I played after the typing tests, so it’s possible that I had already adapted to the keyboard. 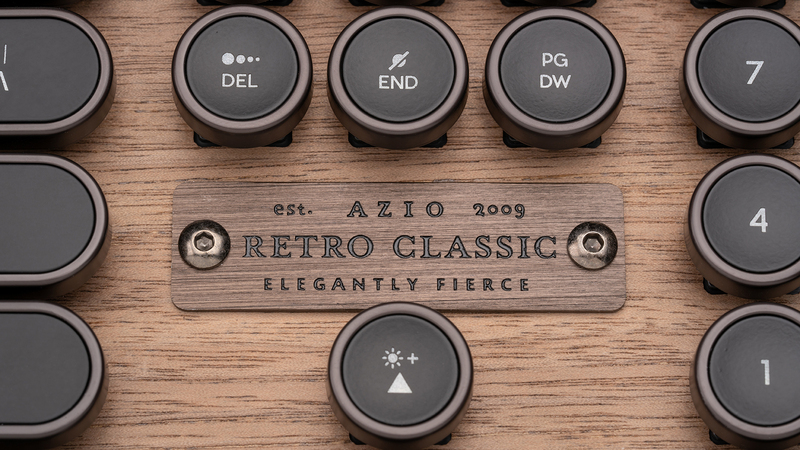 The Azio Retro Classic Mechanical Keyboard is for users who want this very specific look and feel to complement their existing setup. It could also be for the user who wants to add an ironic accent to their modern office. René is a professional entertainment journalist and screenwriter living and working in Southern California.